Did you know that an adult body has 206 bones? I say "adult" because infants have up to 350 bones, and many of them fuse together as they grow. Half the bones are located in our hands and feet. How many bones can you identify? 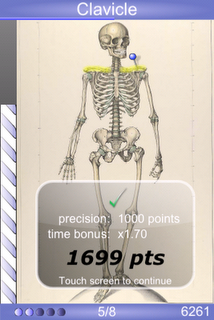 With the help of a new iPhone application, Speed Bones MD, you can now become an expert at naming and locating bones in both skeletal systems - the axial skeleton (trunk of the body) and the appendicular skeleton (limbs). For just 99 cents, much less than a Medical Degree, Speed Bones is a fantastic game that contains dozens of images and helps you learn as you play. Play this game on your iPhone or iPod Touch and compare your score with friends. The maker of this game has also made Speed Muscles MD and Speed Angiology MD. Having all three is a nice little medical package contained on your iPhone. Check out the Apple app store or Benoit Essiambre's blog for more info.